I’ve been dreading telling this story. My trepidation is partially attributed to reliving my time in the City of Lights. 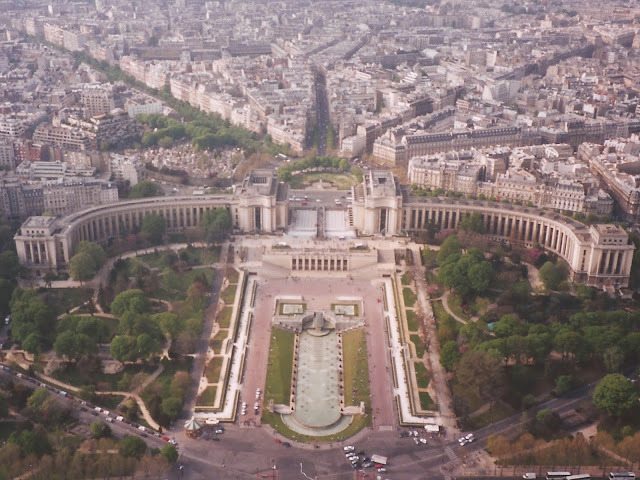 Paris was among my least favorite destinations, as it totally lived up to its snobby, highfalutin, visitor-hating stereotype. The rest of my angst comes from looking back at myself as a young globetrotter. At the time, I lived up to my naive, monolingual, loud American stereotype as well. 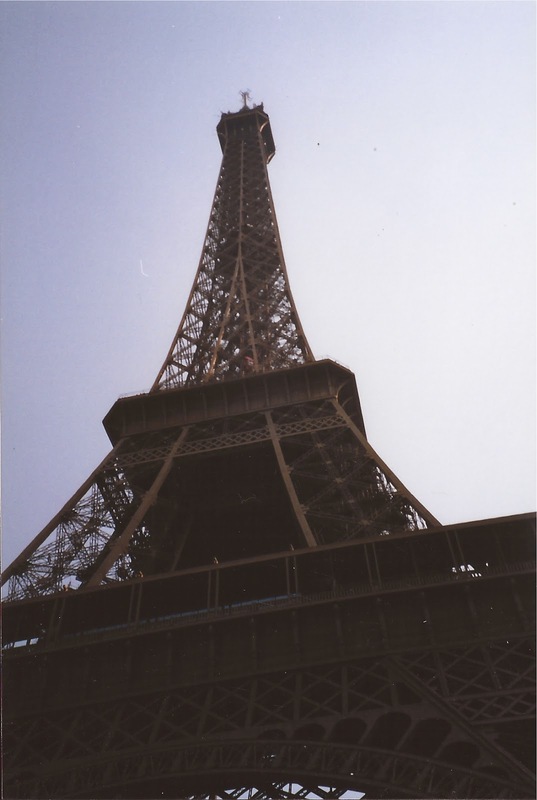 Note: When I visited Paris, I wasn’t quite the shutterbug I am now, so I don’t have a lot of photos to share. As such, I’ve supplemented with royalty-free pictures from pixabay.com that match the memories in my mind's eye. 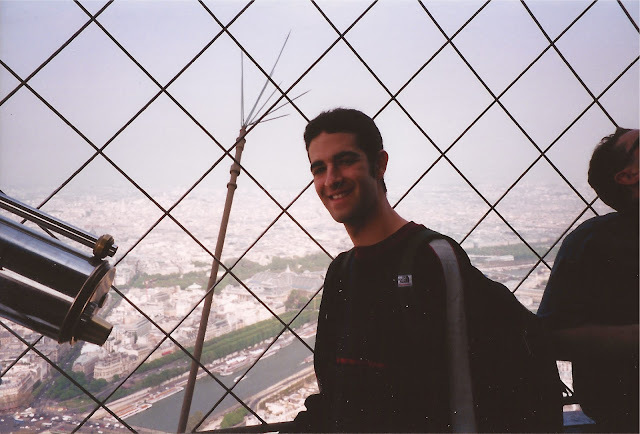 My study abroad program in Stirling, Scotland in 2002 gave me a chance to explore Europe. After spending a few days in London, I took the chunnel to Paris. The ride was smooth and relaxing. I wouldn’t be that relaxed again until I left France. When I arrived at the train station in Paris, I found a ticket kiosk that would sell me a subway pass to my friend Jenny's neighborhood. The interface was all in French. I didn't speak a lick of French. I attempted to decipher the menu, but the options were literally foreign to me. I was overtaken by a feeling of desperation. I had no clue how to get myself a ticket, and I was afraid I’d never figure it out. As I helplessly poked around the kiosk menu, a swarthy-looking character approached me and offered to help me out. I was suspicious of him right away, but I was so flustered, I felt I didn’t have a choice but to accept his assistance. In broken English, he offered to sell me a ticket he already owned. Still suspicious, yet somewhat relieved, I accepted his ticket and asked him how much. He said €40. I had no clue what the cost would be, but that price sounded pretty high. I questioned him, and he pointed to an area on the screen that clearly displayed the number 40. Europe had just moved from the Franc to the Euro a couple of months earlier, so the price was listed in both currencies. He was pointing to the price in Francs, and I knew it. I tried to argue with him, but he kept pointing to the number 40 and saying unintelligible things in broken English. I knew it was a scam, but I didn’t see any other way out of my predicament. 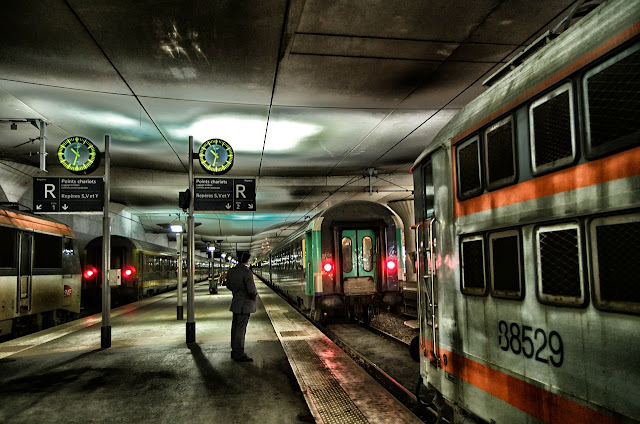 With great reluctance, I handed over the €40, took the ticket, and walked away sheepishly. I had been in the city all of five minutes, and already Paris' disregard of foreigners and my naiveté were screwing me over. My uneasy mindset stayed with me as I boarded the train. I still wasn’t sure I’d make it. Fortunately I got to my destination, and Jenny was there to greet me. I breathed several signs of relief as we embraced. After dropping my stuff off and touring her stylish French digs, we headed out to a cafe in her neighborhood. It was a gorgeous night, so we snagged some outdoor seats and enjoyed some wine while we caught up. We had a wonderful conversation, and I was thrilled to be in the company of someone who could speak the language. While we conversed, we were routinely interrupted by people selling trinkets. They showed no shame in delivering their pitch to sell small sprigs of flowers or laminated poems. It got annoying quickly. Jenny reported that kind of thing was normal in Paris. Half way through our second glass of wine, our attention was again diverted, this time by a tricked out black car that screeched into a nearby intersection and did an abrupt U-turn that was straight out of The Fast and the Furious. The maneuver sent the smell of burning rubber into that air and made a ton of noise, which drew the attention of everyone within earshot. The whole block went silent for a second or two, except for the sound of the car speeding off in the direction it came. Jenny reported that kind of thing was definitely not normal in Paris. As the night went on, I noticed our waiter's interactions with Jenny were increasingly curt. When I asked Jenny if she noticed this too, her expression changed, and she started addressing me as if she was breaking difficult news. She explained that in French culture, it was customary to speak softly, rarely raising your voice above an audible whisper. I had been rambling on in my normal booming American voice the whole time, and she theorized that my volume caused the cold shoulder. Once she pointed it out, I observed everyone around me speaking in hushed tones. In comparison, I was indeed speaking rather loudly. I started feeling terrible for drawing attention to us by being a typical obnoxious American. At the same time, I was also annoyed that such an infraction would warrant rude treatment from a waiter, and example of the snootiness much of the world expects from Parisians. Jenny would be living near that cafe for several more months, so for the sake of her reputation, I promised I'd keep my voice down. Jenny cleared her schedule the next day so she could show me around. 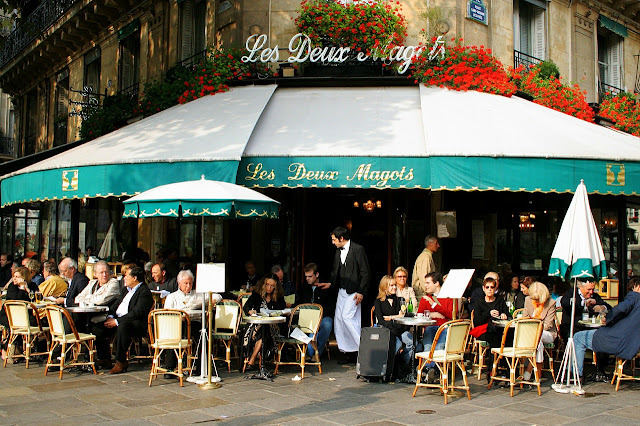 We started our day at Les Deux Magots, a cafe made famous for hosting the likes of Hemingway, Sartre, Picasso, James Joyce, Camus and other well-known writers and artists. It was a gorgeous day, so we snagged a seat outside and enjoyed delicious espresso drinks and a few snacks while we watched the world go by. 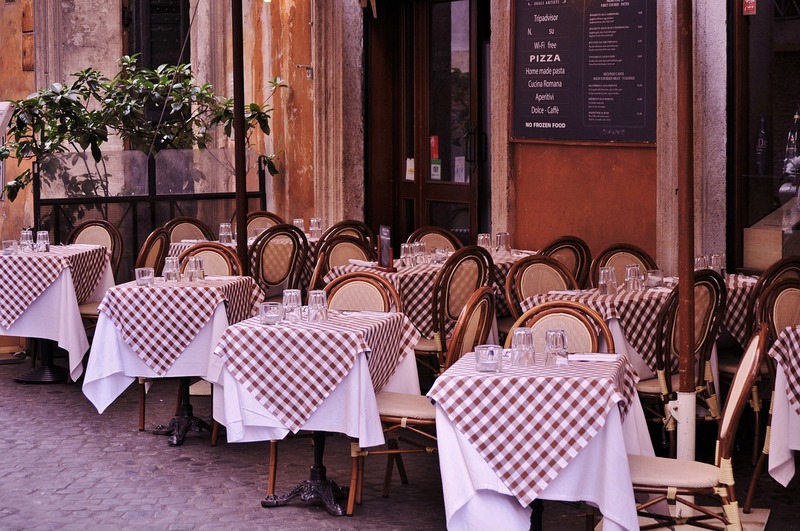 After an interaction with the waiter at the cafe, Jenny explained to me that waiting tables in Paris was a prestigious and highly competitive position, and Parisian waiters were held in high regard. I did my best to keep my voice down so I didn't offend our well-respected waiter. Caffeinated and satiated, we walked to the Jardin de Luxembourg, a huge park with lots of greenery, winding paths and gorgeous gardens. We took up residence in the center of the park, where several rather uncomfortable chairs surrounded a wide but shallow fountain. We got cozy there and had a blast people-watching and enjoying the sun. Eventually we decided to stroll through the park. During our walk, we ran into the Statue of Liberty. Yup. It was a six foot tall, proportional replica of lady liberty. A plaque in front informed us that the statue commemorated France donating the Statue of Liberty to America. I took this as another example of the French living up to their global reputation. 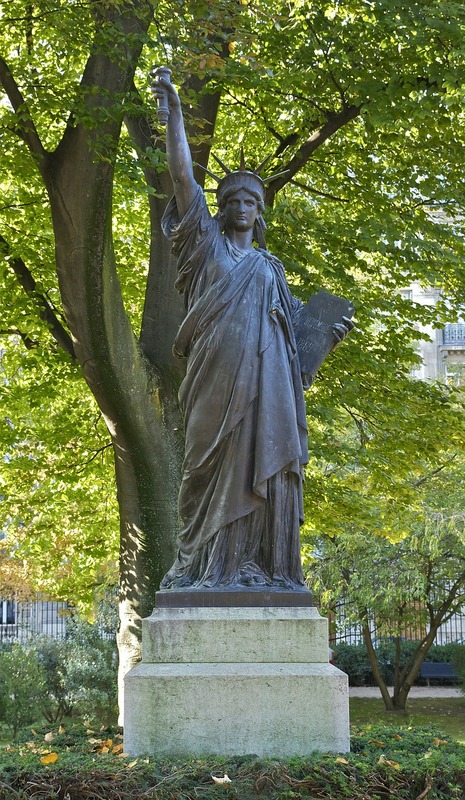 Leave it to France to erect a statue to commemorate their own generosity. 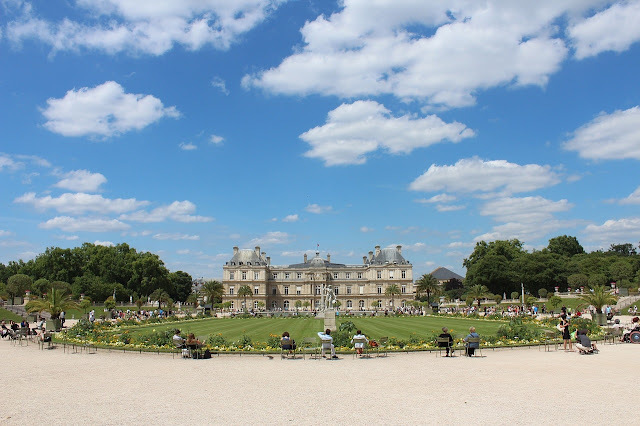 Despite the audacity, Jardin de Luxembourg made for a lovely stroll and served as a great destination on a sunny day. From the park, we wandered to a famous bookstore called Shakespeare and Company Books. The original version of this store attracted the likes of Ezra Pound and F. Scott Fitzgerald, and the newer version pulled in some of my beat generation heroes, including Allen Ginsberg, Gregory Curso and William S. Burroughs. It was a small, cramped bookstore jam-packed with wall-to-wall books. On the surface it wasn’t too unlike any other bookstore, but apparently it often drew famous and up-and-coming writers and huge crowds. Fortunately it wasn’t too crowded when we visited, and we enjoyed a quick browse through the stacks. After a stop for lunch (where I again practiced my soft Parisian voice), we headed off to one of Paris’ most famous landmarks, the Arc De Triomphe. Navigating our way there was a trip, as the Arc was located smack dab in the middle of a fourteen-street intersection. The Arc was impressively decorated, and bigger than I had anticipated. Getting to the top required hiking up a serious series of spiraled stairs (200+ steps), but we were determined to do it. The Arc’s roof served as an observation deck, and fortunately it wasn’t crowded when we got up there, huffing and puffing. We enjoyed the view from the top for a while and took in the city from all angles. 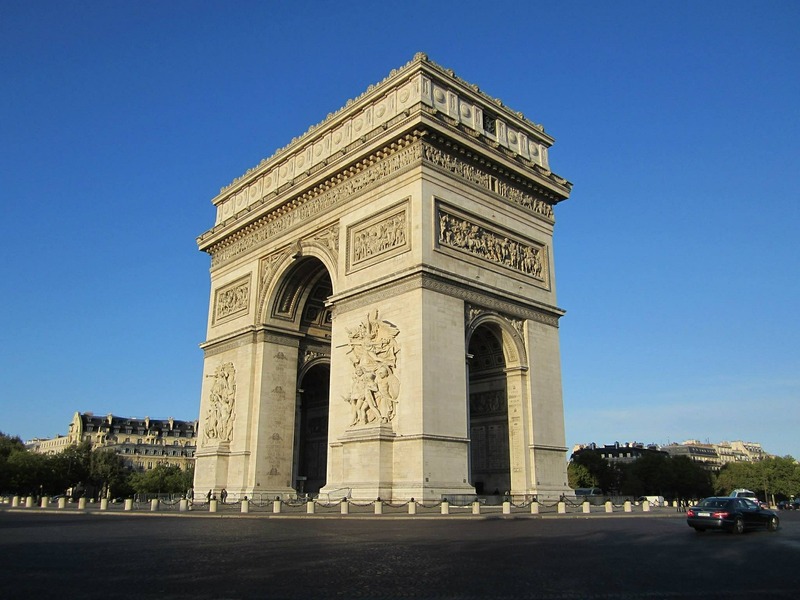 I’m glad I got to see the Arc De Triomphe, but it was a bit anticlimactic and not particularly engaging. Essentially it was one of those landmarks you visit, say, “well, there it is,” and move on. Move on we did. We headed off to dinner at an Italian restaurant that was a favorite of Jenny's. Our meal was delicious, but the youthful naiveté I displayed there left a bad taste in my mouth. Our waiter greeted me in French initially, and I responded with a blank, fearful look before gesturing to Jenny, who took over the communication. She also had to translate the menu for me. This made me feel rather sheepish, and it reminded me of the challenges inherent in traveling to a non-English speaking country. Soon after, the waiter returned with the bottle of wine we ordered, and he promptly poured me a taste. He then looked at me expectantly, and I met his gaze with that same confused, scared look. Jenny told me it was my responsibility to taste the wine and approve of it. My face turned as red as the wine as she explained this tradition, and I quickly took a sip and nodded as if I knew what I was supposed to taste. With that, he poured two full glasses and I enjoyed a few comforting sips to combat the embarrassment. Looking back, I can’t help but laugh at my twenty-one-year-old self for not knowing how to handle a simple wine pouring. Ah well. Nothing a delicious Italian meal couldn’t erase. 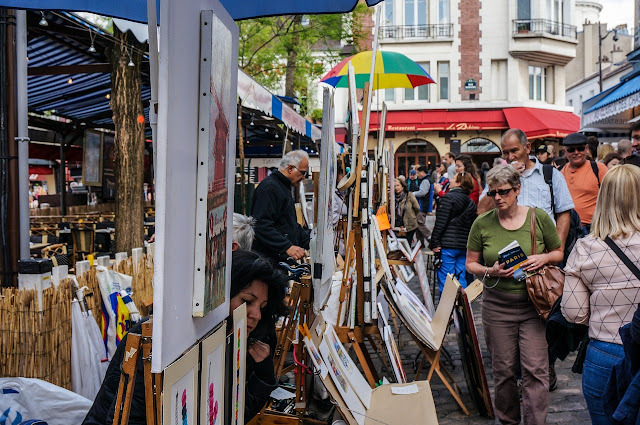 Our whirlwind tour of Paris concluded with a hike to Montmartre, a former artist hangout turned tourist spot with narrow, brick-lined streets housing bars, restaurants, cafes, galleries, gift shops, street artists and musicians. The vibe was fun and inviting, and it made for a wonderful stroll. During our walk, we passed an Irish pub. I had been studying in Scotland for the last couple of months, so bellying up for a pint had become second nature. I suggested we go in for a drink. Initially Jenny wasn’t too keen on the idea, as drinking beer at a bar was decidedly un-French. Apparently Paris was too good for a delicious brew at the end of a long day. In my book, that’s another tally in the loss column. Eventually I convinced her and we went in. The beer prices shocked me. A beverage that would cost €2 in Scotland went for a whopping €9 in Paris. Sheesh. Regardless, the beer was cold and refreshing, and it was great to step into a familiar environment after being on foreign soil for so long. 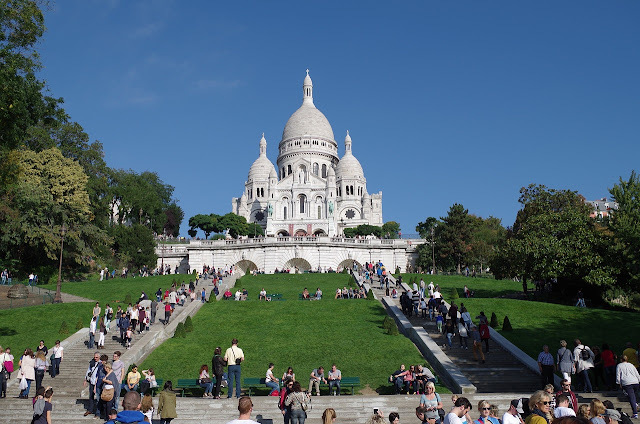 After taking the last sips of our drinks, we walked towards the Sacré-Cœur Basilica, a huge white church in the center of Montmartre with a sprawling sloped lawn in front. We joined the large crowd of tourists and locals comfortably lounging on the lawn, uncorked a bottle wine and watched the city below light up as darkness settled in. As the day drew to a close, I had to admit that despite its stereotypical shortcomings, Paris delivered some enchanting moments, with our time on the lawn overlooking the city being one of them. Jenny had class the next day, so I was on my own. My first stop was Paris’ most famous landmark, the Eiffel Tower. Jenny gave me specific instructions on how to get there, and I managed to find the tower without getting ripped off, a minor miracle. The walk there was long and sweaty, and the streets were lined with vendors and beggars. 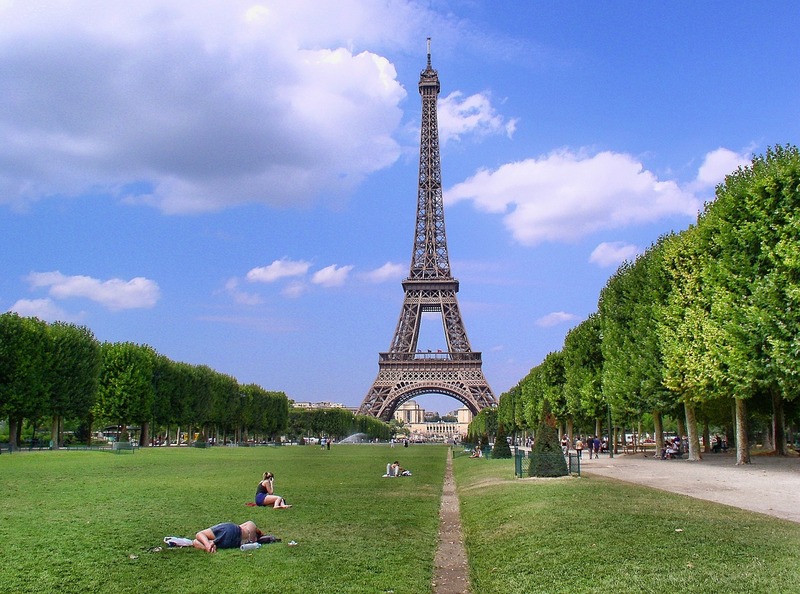 It was a bit unsettling, and my disdain for Paris grew as I approached the tower. Adding to this sentiment was my initial impression of the tower once it was within eyesight. I was surprised to see that the tower’s metal was a drab brown color, which was quite different than the gorgeous grey steel I had always assumed it was made out of. I feared I was up for yet another disappointment as I got in an unfathomably long line to get tickets. However, things changed in a hurry when I struck up a conversation with the family in front of me. They were visiting Paris from Spain, and they were extremely kind and welcoming. I was heading to Spain the next day, so I used our meeting as an opportunity to practice my Spanish. We conversed for quite a while, telling our stories and comparing notes on Paris. They were very forgiving of my rudimentary Spanish, and they gave me a few pointers to improve my language skills. They even offered me a job in the States, which would have involved shipping things from Virginia to Columbia. I didn’t dare to inquire about what would be shipped, and they were quite understanding when I politely declined. As we approached the ticket counter, I read up on the various ticket options. The cheapest option involved walking up 600+ stairs and then taking the elevator to the top, but it was blazing hot and I wasn’t up for the challenge. A slightly more expensive but still affordable option brought visitors to the second level of the tower via an elevator, while the most expensive ticket took that same elevator all the way to the top. The money scammed from me upon my arrival and the expensive beers had seriously cut into my budget, and I considered my options out loud, openly contemplating going only half way up to save some cash. My Spanish friends weren’t having it, and they insisted that I let them purchase my ticket to the top. I was touched by this generous offer, and I gladly accepted, thanking them excessively. 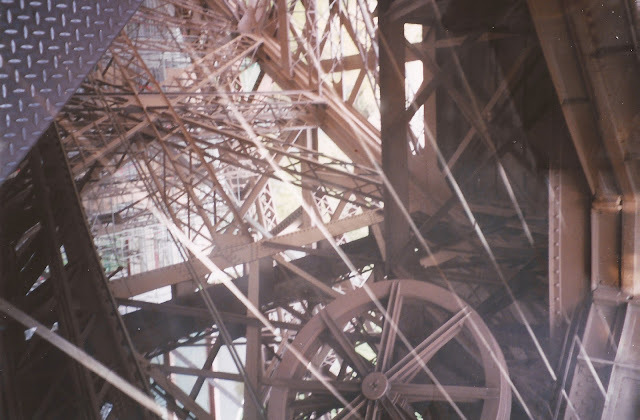 We shared an elevator to the top, where I marveled at the inner workings of the tower. Exposed wheels, pulleys and cables worked harmoniously together to pull the elevator up. 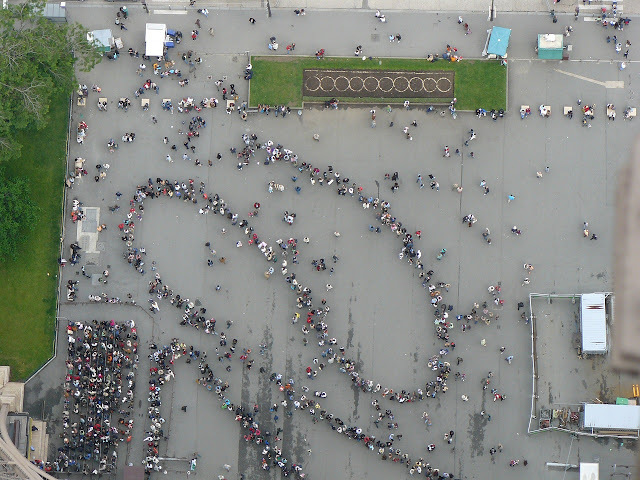 It was such a cool process to witness, and it started to change my impression of the Eiffel Tower. While circling the tower and taking in the ever-changing views, I ran into my Spanish friends again, and they took this shot of me in exchange for snapping a few family photos for them. After admiring the view a little longer and marveling at the inner workings of the tower again on the way down, I took a walk over to Champ de Mars, a huge, open park adjacent to the tower, where I staked out a spot on the grass and stared at the tower for a while. It’s not every day that you’re in the presence of one of the world’s most famous attractions, so I sat there and savored it. 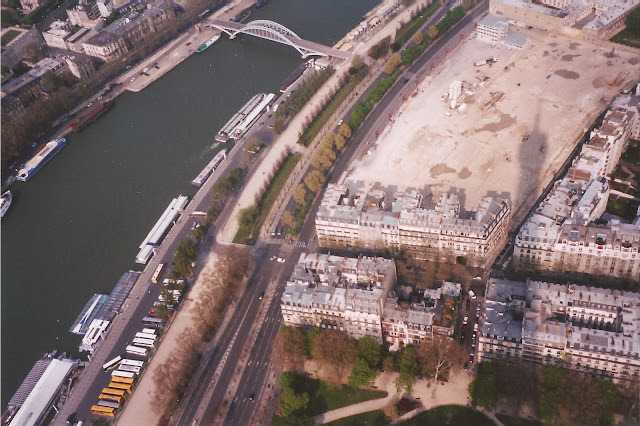 As I reflected on my Eiffel Tower experience, I started to think that maybe I had been too harsh on Paris overall. Maybe the place wasn’t so bad. Maybe I was even starting to like it. As I contemplated my changing mentality, I realized my visit had worked up quite an appetite. I found a pastry counter on one of the nearby streets, and as I approached, that helpless feeling of not being able to communicate crept in again. My stomach wasn’t about to give in to my fear, so I bit the bullet and tried to order some food. Perhaps the vendors near the tower would be more welcoming to foreigners? Ummm…no. Instead of putting in the slightest bit of effort to figure out the meaning of my hand gestures and short English phrases, the lady behind the counter gave me a snotty, disapproving look and make me work for the ham and cheese croissant I was trying to order. 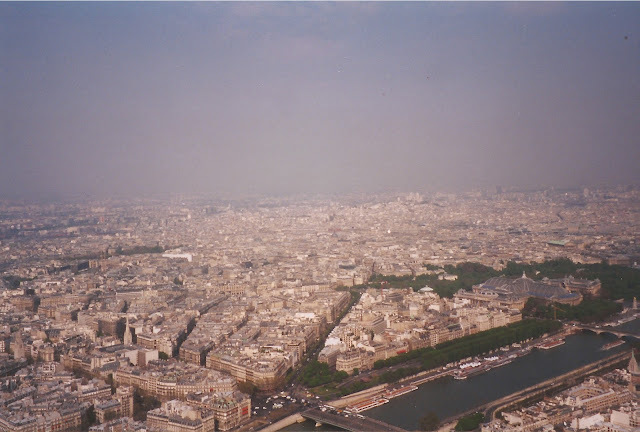 It was embarrassing, and it brought all of my frustration with Paris back up to the surface. The notion that I was starting to like Paris went straight out le window. After swallowing my pride and washing it down with the croissant, I headed towards my final destination in Paris, the Louvre. 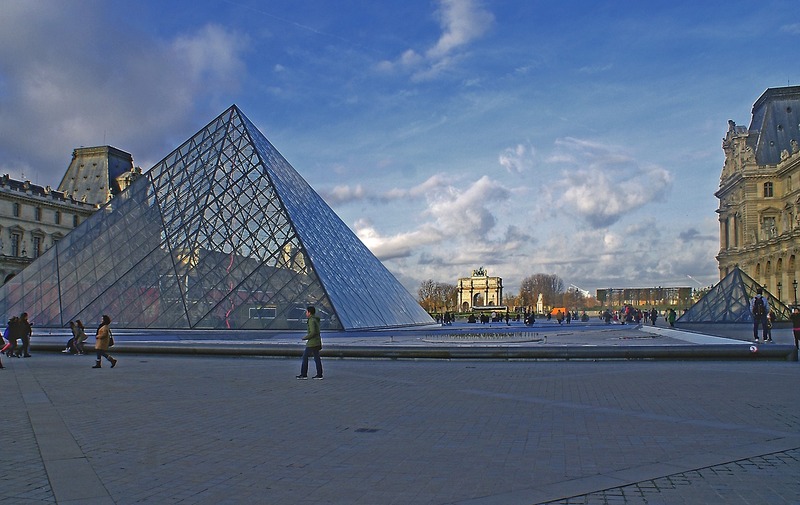 I didn’t know much about the Louvre going into my visit, other than that it was a famous art museum that housed the Mona Lisa. As I approached the museum's protruding triangular structure, I was struck by its modern, exciting design. Unfortunately, the art inside was nowhere near as contemporary. The majority of the pieces were quite old, with many of them dating back to the days where the main purpose of art was to praise Jesus. I wandered from room to room, glancing at painting after painting of JC. While I could appreciate the significance of the paintings, that style of art was not my chalice of tea. 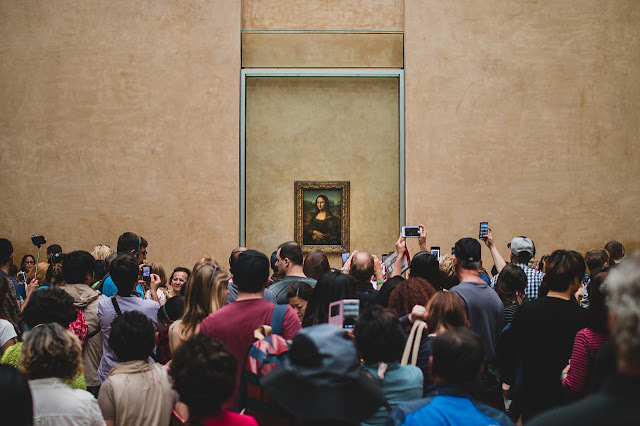 Eventually I made my way to the Mona Lisa, the museum’s prized exhibit. Da Vinci’s master work drew quite a crowd, and it was extremely difficult to get a close look. I managed to get a peek at it from afar, and my main impression was that it was much smaller than I had anticipated. I had much more success viewing one of the other well-known pieces, the Law Code of Hammurabi, a huge stone monolith with the tenants of Hammurabi’s code meticulously carved into the stone. It was an engaging and impressive piece, and the craft and significance of it was quite the draw, making the artifact the saving grace of yet another disappointing Paris experience. After returning from the Louvre, I enjoyed one last evening with my dear friend Jenny. In the waning hours of our visit, I confessed my frustration with not speaking the language in a country that had no tolerance for such behavior, and talked about my dislike for Paris overall. She totally understood, and said some words that still ring true: Paris isn’t for everyone. It certainly isn’t for me.